Helicopter Antisubmarine Squadron ELEVEN (HS-11) was established on 27 June 1957 at Naval Air Station (NAS) Quonset Point, Rhode Island. The primary mission of the Seabat was Antisubmarine Warfare (ASW) utilizing a dipping sonar. Later models of the Seabat were upgraded with Doppler radar and automatic stabilization and hover capabilities for all-weather operations. The HS-11 "Sub Seekers" were assigned to Carrier Anti-Submarine Air Group 52 (CVSG-52) with the tail code AS and deployed onboard USS WASP (CVS 18). In 1962, the squadron transitioned to the Sikorsky twin engine SH-3A Sea King and would later upgrade to the SH-3D and SH-3H in 1969 and 1980, respectively. In December 1969, HS-11 became the first ASW helicopter squadron to deploy as part of a modern carrier air wing with CVW-17 onboard USS FORRESTAL (CVA 59). From 1970-1973, HS-11 was assigned to CVSG-56 deploying onboard USS INTREPID (CVS 11) with the tail code AU. On 17 October 1973, HS-11 moved to its new homeport of NAS Jacksonville and was re-assigned to Carrier Air Wing ONE (CVW-1) where it remains assigned to this day. 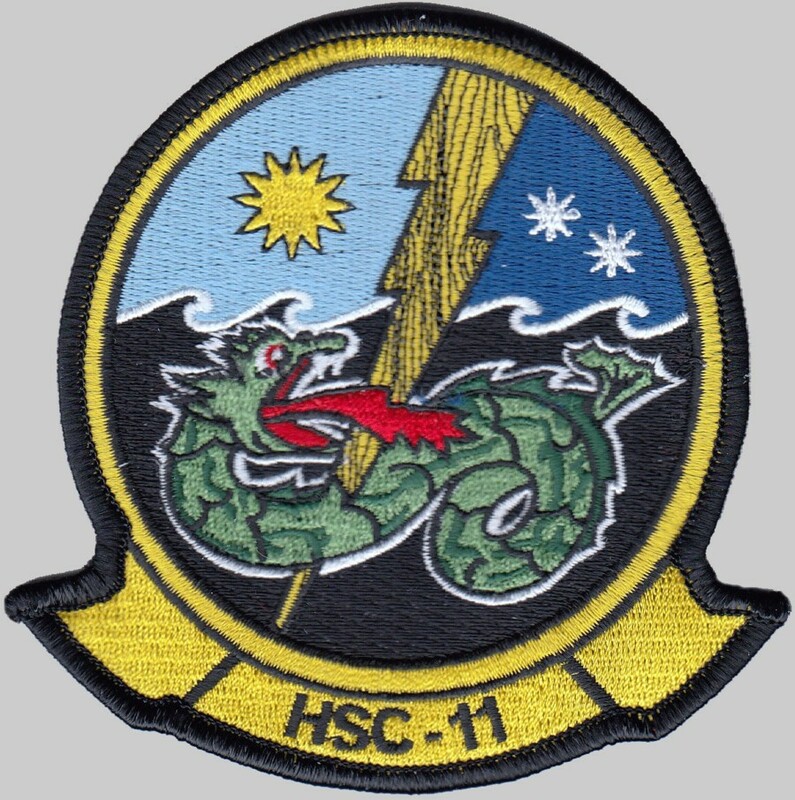 In 1989, HS-11 changed its official call sign to Dragonslayers. HS-11 has made deployments onboard USS JOHN F. KENNEDY (CV 67), USS AMERICA (CV 66), USS GEORGE WASHINGTON (CVN 73), USS THEODORE ROOSEVELT (CVN 71) and USS ENTERPRISE (CVN 65). 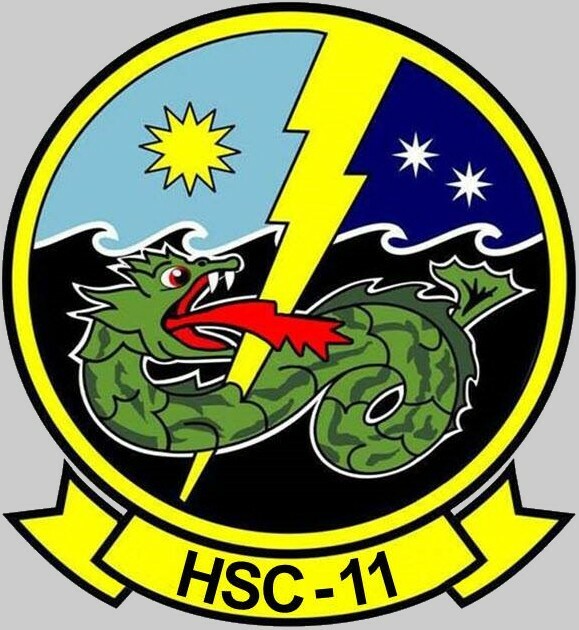 HS-11 is currently attached to STRIKE GROUP TWELVE. In 1994, HS-11 transitioned to the Sikorsky SH-60F and HH-60H Seahawk, the current aircraft in use today by the Dragonslayers. The capabilities of this latest airframe allowed the squadron to greatly expand its mission areas. In addition to ASW and Search and Rescue, the Dragonslayers now added such missions as Vertical Replenishment, Naval Special Warfare Support, and Combat Search and Rescue to its capabilities. With the addition of the Hellfire missile system and GAU-16 .50 caliber machine gun in 1999, HS-11 became capable of effectively conducting Antisurface Warfare. The Dragonslayer history has many distinguished highlights. In November 1962, HS-11 sailed to the Caribbean onboard USS WASP to enforce the Cuban quarantine. Later that decade, the squadron played a leading role in astronaut recovery operations during the Gemini missions, plucking from the sea such famed astronauts as White, McDivitt, Lovell, and Aldrin. In 1976, the squadron was awarded the Navy Unit Commendation for saving countless lives after ship collisions at sea while attached to USS JOHN F KENNEDY. Over the years, HS-11 has the answered the domestic call for help numerous times in support of hurricane relief efforts, including Hurricane Andrew in 1993. In 1999, squadron SAR swimmers rescued nine men whose ship was sunk during Hurricane Floyd in winds over 50 knots and seas measuring 30 feet. In September 2008, as Hurricane Ike swept through Galveston, TX, HS-11 was the first Navy squadron on-station just hours after the hurricane moved overland. In January 2010, the squadron detached four aircraft onboard the USS CARL VINSON (CVN 70) and sailed to Haiti in support of Humanitarian Assistance and Disaster Relief operations following the 7.0 magnitude earthquake. In 2012, HS-11 once more made its mark in history while embarked onboard the USS ENTERPRISE (CVN 65), serving with honor and distinction during the "Big E's" final deployment. Most recently, the Dragonslayers deployed aboard the USS THEODORE ROOSEVELT (CVN 71) in support of OPERATION INHERENT RESOLVE. While directly contributing to the success of CARRIER STRIKE GROUP (CSG 12) through continuous alert PSUW/SAR and Plane Guard responsibilities, HS-11 rescued four souls, flew over 3,000 hours, executed four detachments to CAMP BEUHRING, KUWAIT, and achieved a 99% on-time launch rate. With seven aircraft aboard (3 SH-60Fs and 4 HH-60Hs), this marked the final deployment of these two series of aircraft, and the final deployment of an HS squadron. HS-11 returned to NAS Jacksonville in November, 2015, followed by a transition to Naval Station Norfolk during the summer of 2016. 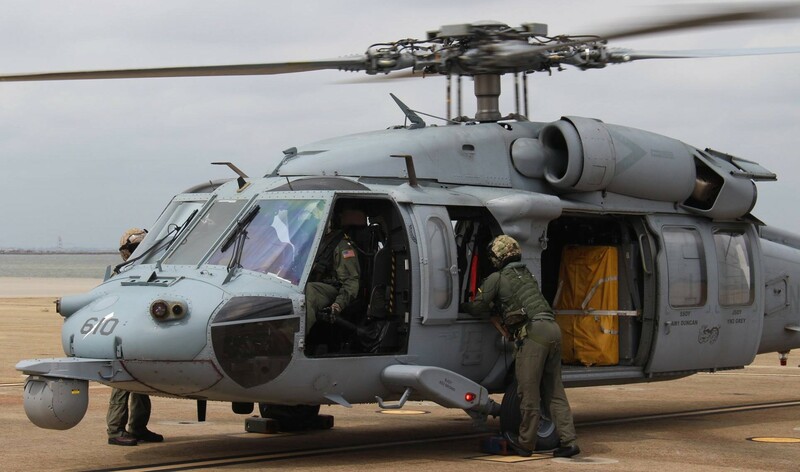 On June 1st, 2016, HS-11 became Helicopter Sea Combat Squadron Eleven (HSC-11), marking the final step in the Rotary Wing Master Plan of transitioning all HS squadrons to HSC, and phasing out the H-60 Foxtrot and Hotel series. 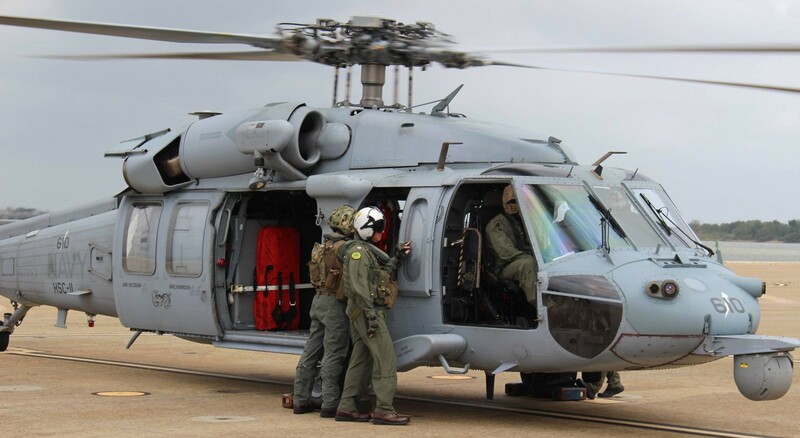 HSC-11 is proposed to be safe for flight September 30th, 2016, flying the MH-60S Seahawk.